Hello from the Clubhouse at Langara, where we spend our summers hunting for the elusive monster tyees! 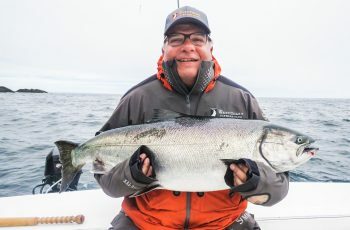 Three tyee to report in the last 24 hours, including Mark Bemisters 40 lber,caught this pm, and a 42 taken yesterday in boat 17 by Robert Yoshioka. 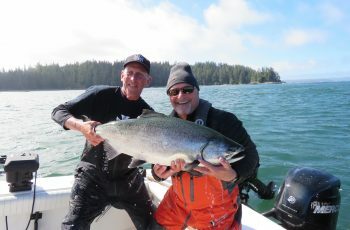 Also taken was a 39 from out west yesterday afternoon, will have all the tyee catching names on the final trip report. 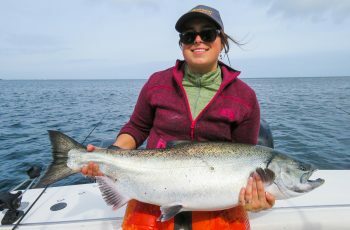 We are still trolling or some would call wandering offshore Lacy, seeking bait balls and the schools of springs that closely follow them. The last few days have seen a swell and a chop, so it is not easy to stay on the feed, but that is the ticket. Sometimes frustrating watching the boat 100 feet away play fish while you stare Banning style at dead rods. This is what offshore fishing can be like, when you are the boat that is on it is great, when you drop the ball, it hurts. We are trolling 60 to 80 feet with our cut plugs, chasing any boat hooked up as the school of bait is easier to find. Conelly in Boat 17 said he was sitting on several balls when he hit a bunch of fish including the 42 angled by Bob, his largest fish ever. 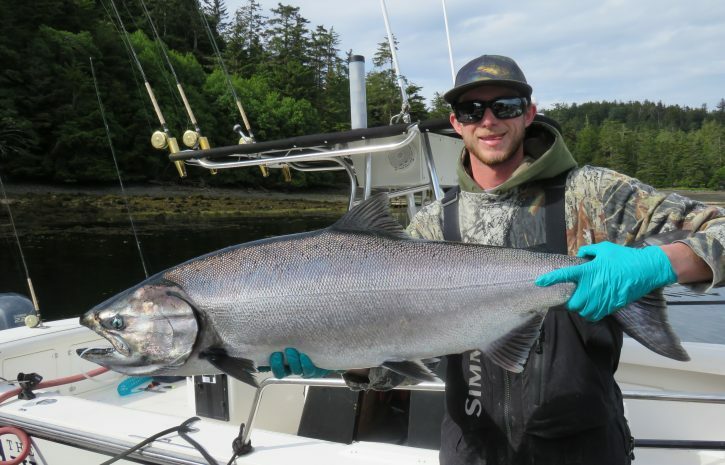 This fish hit at 73 feet on the rigger. most of the guides reported a couple in the low to mid twenties and a bunch of low to mid teeners. The whales are around feeding as well, and I did cast my herring jig in the feed grabbing some nice hawg herring for tomorrow. 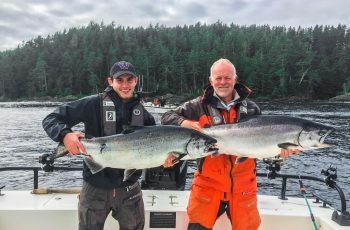 The halibut guides did a nice job out on the grounds as well, Boat 17 had his two fish limit in 40 minutes, as did Jordie, both boats reported releasing large fish over the 100 lb size in favour of fish 40 to 70 lbs. 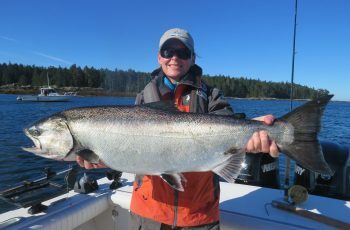 The East side continues slow, a couple boats hit jacks off Cohoe point tonight, but no big fish. Guide Scuttlebutt was that Gunia continues dead, soon we hope this area awakens. The weather looks good for tomorrow, so until then, off too bed for me, time to start catching some early Hippas, I have to get going! On a final note, myself, Pat, Korey, Todd, Jordie, Kui, and the boys were glued to the tv tonight watching no. 33 win his first STANLEY CUP! Way to go Willie, well done and so deserved! We want the cup here at Langara! Also like to give a big shout out to my ex Flyers Richards and Carter…and the amazing team coached by Mr. Sutter, the Kings showed us all what team work can accomplish!